1. Preheat oven to 400F, line a baking sheet with parchment paper. 2. Cut the tops off your apples and scoop out the inside, being careful to not get too close to edges (this could cause a collapsed apple!) This step is easier than it may seem. Please apples on baking sheet. 3. Chop one apple into small to medium sized chunks. Heat vegan butter (under “filling”) in a small saucepan on medium heat, and then add all other filling ingredients to pot, including apples. Cook for about 15 minutes or until apples are nice and soft. Set aside. 4. In a small bowl, mix together crumble ingredients. 5. Time to assemble! 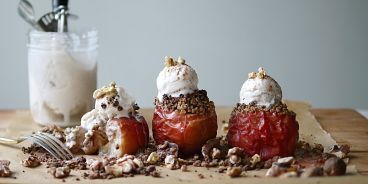 Stuff your hollowed out apples with the warm apple filling and then top generously with crumble. Bake for about 25 to 30 minutes (until soft and wrinkly looking). Serve with ice cream (I love Nice Vice, Luna & Larry’s and So Delicious) and an extra sprinkling of cinnamon.